Midcoast Conservancy and Pemaquid Watershed Association have courtesy boat-inspector programs. 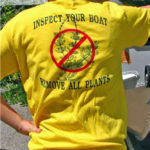 Courtesy boat-inspector volunteers check boats for invasive aquatic plants that could harm the waterways. 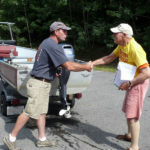 Both land trusts need more volunteers to be on the courtesy boat-inspector team this summer. 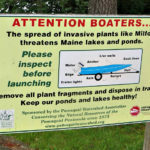 On Maine ponds and lakes, the first line of defense against invasive aquatic plants are the courtesy boat inspectors. Many new invasive aquatic plant infestations occur in shallow waters near public boat-launch facilities, so it is obvious invasive plants move from lake to lake on the boats and equipment of unsuspecting boaters. If people are the cause, they can also be the cure. What do courtesy boat inspectors do? The program is really an educational one. 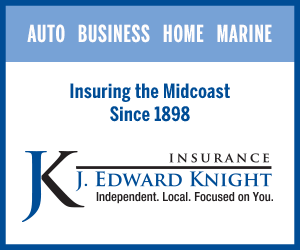 As boaters launch and remove their boats from the water, courtesy boat inspectors will discuss with boaters how invasive aquatic plants spread, show how to inspect boats and equipment for plant fragments, urge boaters to inspect before and after every launch, distribute information about invasive plants, and articulate Maine law regarding the transport of these plants. 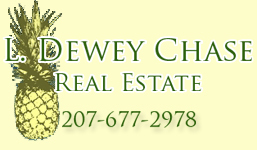 Each inspector can sign up for a two–hour shift on Saturdays and Sundays through Labor Day. Training is available. Volunteers will get a free bright-yellow courtesy boat-inspector T-shirt and learn lots of interesting facts about Maine ponds and lakes. 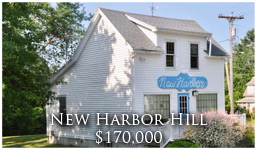 The PWA locations are at Pemaquid Pond boat ramp and the Biscay Beach boat ramp. 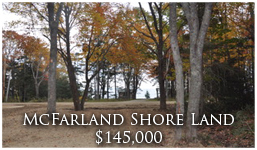 The Damariscotta Lake location is at the boat ramp off Bunker Hill Road. A courtesy boat-inspector training session will be held at the Pemaquid Watershed Association office, at 584 Main St. in Damariscotta, at 4 p.m. on Thursday, June 14. For more information, contact Carolyn, the PWA land and water program manager, at 563-2196 or carolyn@pemaquidwatershed.org, or call Midcoast Conservancy at 389-5150 and ask for Garrison Beck, director of water conservation, or email garrison@midcoastconservancy.org. Pemaquid Watershed Association was established in 1966 and is a volunteer-based, membership-supported nonprofit land trust whose mission is to conserve the natural resources of the Pemaquid Peninsula through land and water stewardship and education. Go to pemaquidwatershed.org for more information. Midcoast Conservancy protects and promotes healthy lands, waters, and communities through conservation, outdoor adventure, and learning. For more information, go to midcoastconservancy.org.